GENEVA, 22 March 2017 (WMO) / The World Meteorological Organization (WMO) has released its new, long-awaited, digitized International Cloud Atlas - the global reference for observing and identifying clouds, which drive weather patterns, the climate system and the water cycle. The new Atlas combines 19th century traditions with 21st century technology. It contains hundreds of images submitted by meteorologists, photographers and cloud lovers from around the globe. It includes new classifications, including volutus, a roll cloud; clouds from human activities such as the contrail, a vapour trail sometimes produced by airplanes; and asperitas, a dramatic undulated cloud which captured the public imagination. It also features meteorological phenomena like rainbows, halos, snow devils and hailstones. "The International Cloud Atlas is the single most authoritative and comprehensive reference for identifying clouds. Its reputation is legendary among cloud enthusiasts and it serves as an essential training tool for professionals working in meteorological services, and in sectors such as aviation and shipping," said WMO Secretary-General Petteri Taalas. "Throughout the centuries, few natural phenomena have inspired as much scientific thought and artistic reflection as clouds," said Mr Taalas. "More than two millennia ago, Aristotle studied clouds and wrote a treatise addressing their role in the hydrological cycle. And today, scientists understand that clouds play a vital role in regulating the Earth's energy balance, climate and weather," said Mr Taalas in a message for World Meteorological Day on 23 March. "If we want to forecast weather we have to understand clouds. If we want to model the climate system we have to understand clouds. And if we want to predict the availability of water resources, we have to understand clouds," said Mr Taalas. Understanding Clouds is the theme of this year's World Meteorological Day, which celebrates the anniversary of the convention establishing WMO in 1950 and showcases the essential contribution of National Meteorological and Hydrological Services to the safety and wellbeing of society. The themes chosen for World Meteorological Day reflect topical weather, climate or water-related issues. Understanding Clouds was chosen to coincide with the launch of the digital version of the International Cloud Atlas, after an exhaustive revision process and a public call for images from all over the world. The International Cloud Atlas was first published in the late 19th century. It contains a detailed manual of standards and numerous plates of photographs of clouds and certain other weather phenomena. It was last updated in 1987 - before the Internet era. For the first time, the 2017 edition will primarily be a web-based portal, allowing for much richer content and presentation. It may be published in hard copy at a later date. "This is THE world reference for observing and classifying clouds and other weather phenomena. The Atlas contains pictures, definitions, and explanations that are accepted and used by all WMO's 191 Member countries and territories," said Bertrand Calpini, President of WMO's Commission for Instruments and Methods of Observation (CIMO), which oversaw the revision process. "This new edition brings together for the first time all types of measurements, including very high-tech surface-based, in situ and space observations and remote sensing, thus giving to the human observer a revolutionary tool to understand clouds," said Mr Calpini. "The International Cloud Atlas task team had to choose from thousands of images from meteorologists, cloud lovers and photographers around the world," said Chi-ming Shun, Director of the Hong Kong Observatory, which is hosting the web portal. "We selected the best of the best. We feel honoured to be involved in such a visible product of WMO. We applaud WMO for updating the International Cloud Atlas which provides a unique platform for engaging the public in better understanding clouds, weather and climate." There are ten basic cloud "genera," which are defined according to where in the sky they form and their approximate appearance. The new International Cloud Atlas has made no additions to these 10 genera. The 10 genera are subdivided into "species," which describe shape and internal structure, and "varieties," which describe the transparency and arrangement of the clouds. In total there are about 100 combinations. The genera are subdivided into species. The new International Cloud Atlas has added a new species: volutus or roll cloud (from the Latin volutus which means rolled), which occurs within the genera Altocumulus and Stratocumulus. It describes a long, typically low, horizontal tube shaped cloud mass that often appeals to roll about a horizontal axis. Best known of these is asperitas (from the Latin meaning roughness), Photographs of the dramatic, wave-like cloud captured the popular imagination around the world. 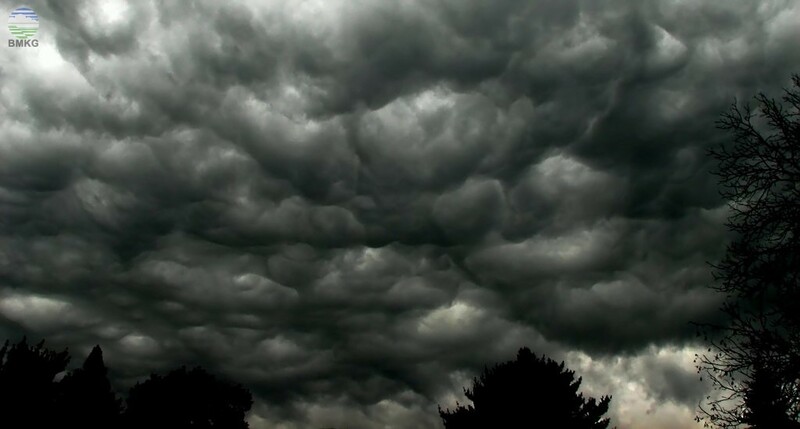 The Cloud Appreciation Society argued for a new classification to be used to describe clouds with this appearance. The Atlas includes the winning photograph from a Cloud Appreciations Society competition on Asperitas. "Asperitas was first identified with the help of citizen science, enabled by modern technology. When Cloud Appreciation Society members send us photographs of dramatic skies from around the world, it is possible to spot patterns. This is how the proposal for a new classification came about, and we are delighted the WMO has chosen to include it in their definitive reference work for cloud classification," said Gavin Pretor-Pinney, founder of the Cloud Appreciation Society. A new accessory cloud, flumen, has been included. Commonly known as "beaver's tail," it is associated with a supercell severe convective storm. The International Cloud Atlas also proposes five new "special clouds:" cataractagenitus, flammagenitus, homogenitus, silvagenitus and homomutatus. The suffix genitus indicates localized factors that led to cloud formation or growth, while mutatus is added when these caused the cloud to change from a different form. These special clouds are influenced by large waterfalls, localized heat from wildfires, saturation of air above forests and humans. Thus, a common example of homogenitus is contrails, sometimes seen after aircraft.